Buon Natale! And Happy New Year! Hope you are enjoying the beautiful Florida weather. 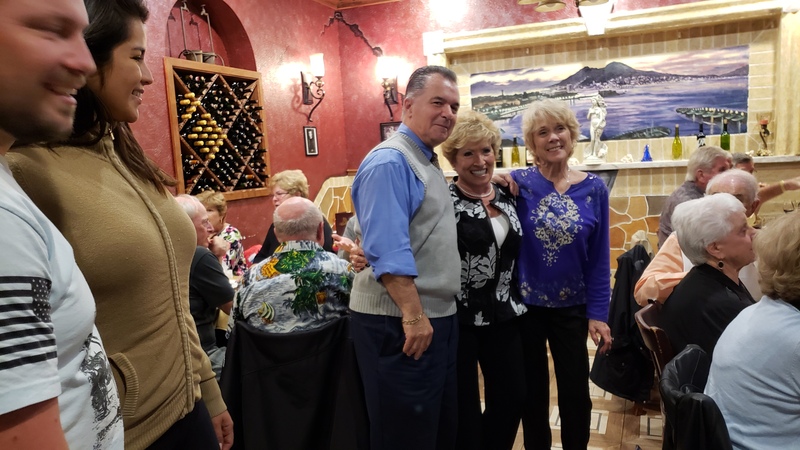 The IAC annual Christmas party was hosted by Bill and Barbara Taranelli, where the club feasted on traditional foods, such as homemade Manicotti and meatballs, accompanied by a buffet of salads and fabulous appetizers. And how about the fabulous desserts? Homemade Pizzelles, Italian cookies, brownies and Tiramasu were big hits. The gift exchange was the best entertainment around with lots of laughs and thoughtful gifts. One guest pranked the group when he thanked the anonymous giver for the $100.00 bill in his bag. As President Mary Rio thanked the giver for the generous gift, the receiver revealed he had the bill “up his sleeve”! One guest had even offered to trade her Panetone for that bill. What a positive way to celebrate a holiday and a new year.. In January, the club was hosted by the Martins, where the foods of heritage were in abundance and plans were made for the remainder of the year. The following week, IAC members were invited to The Chefs of Napoli for dinner and socializing. We also surprised the lovely Shirl Mabie with a birthday cake. The whole restaurant sang Happy Birthday and enjoyed a fabulous cake made by President Mary Rio. Some patrons in the restaurant even offered to buy a piece of the cake! Two weeks later, the Martins hosted the club again for Superbowl VIII, where we feasted on Lasagna, meatballs, turkey, and numerous munchies. While it was a low scoring game, a few of the club won the prediction pool. The 2019-20 events are being planned already! With three meetings left this season, the committees are working on the annual golf tournament to be held in November and the formal dinner dance in March, 2020. This season will come to a close in May at the annual picnic graciously hosted by Jane and Giac Modica. So, if on any given first Tuesday you smell garlic, hear the sound of Italian music, and the sound of wine glasses clinking all night, it could be the Italian club having a meeting near you! For information on joining the HH Italian American Club, please contact any of the officers listed above or a member.